This short, bulbous plant blooms in late winter or early spring. Leaves are basal and grasslike, with silver midrib. 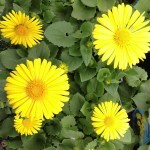 ‘Purpureus Grandiflorus’ bears single, to 2 1/2 inches long, tubular, rich violet flowers with bright yellow stamens. 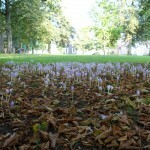 If you are not a strict “clean lawn” person, crocus are welcomed additions sown freely in the lawn in generous drifts, especially at the end of walks, along the edge of drives, or beneath trees. This works especially well in warm season lawns, because by the time you mow the lawn for the first time, it’s ok to to mow the crocus foliage. Important Info : Best if grown in full sun and gritty soil. Size:Height: 0 ft. to 0.42 ft.